JNL Ringing Books | A support site for John Longridge's bell ringing books. A support site for John Longridge's bell ringing books. Happily, the first print-run of C&C have all been sold and the new stock have now arrived. For more information see Conducting & Coursing Order. Since 2014, all profit from the sale of John’s books are being donated to Cancer Research to help pay for research and bring forward the date that this horrible disease is consigned to history. I have just setup a fundraising page on the Cancer Research web site and have transferred £1000 from book sales so far (since April 2014). So a BIG THANK YOU to everyone who has bought books so far. The 5184 Original Major by Giles B Thompson on page 10 is false. This was reported by Giles Thompson in the Ringing World 1983, pg 272. Many thanks to Graham John for the update. For the full errata listing for the series, please see Composition 50x Errata. 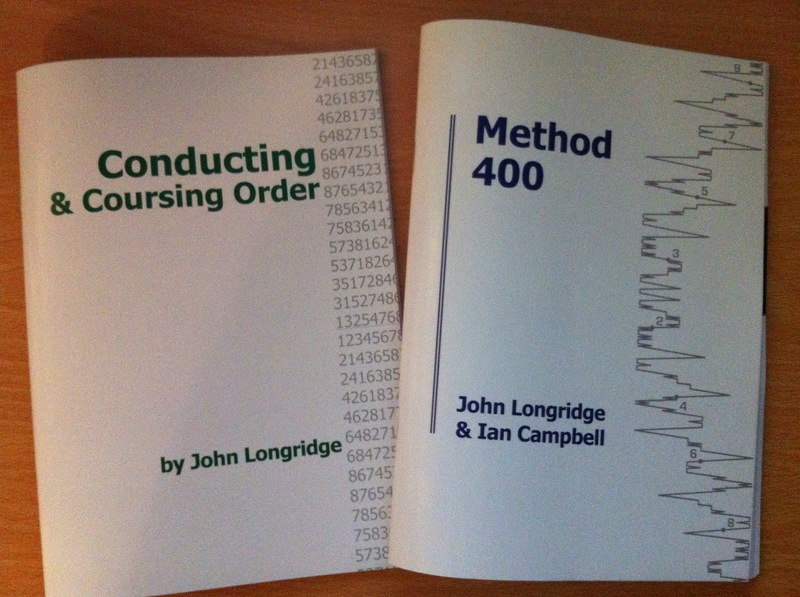 It’s later than I’d hoped but they’re here – the new editions of Conducting & Coursing Order and Method 400. C&CO is one of the best-selling of Dad’s books and has been out of print for some time now. This one is a faithful reproduction of the original but with a more modern look and now comes with an online worksheet for people who don’t like writing in books! The book is aimed at those who have some experience of conducting: it does not look to explain how to call but looks at how you can use coursing order to conduct touches/quarters/peals with exercises and example compositions. Method 400 is the republication of Method 300 with — you guessed it — 100(ish) more methods. The book has been reproduced using the same line drawing software I used for Standard 90 but with the addition of some subtle grey lines to mark the treble crossing points. The extra methods are taken from the most popular methods that have been named in the 30 years since the book was first published by Dad and Ian on the state-of-the-art computer plotter at Exeter University! Orders now being taken, just about in time for Christmas! £7.50 each for UK delivery with discounts for bulk orders. I’m pleased to say that both Conducting & Coursing Order and Method 300 (now Method 400) are nearing completion. Apologies to those who are waiting: I’m not going to make my promised date of the end of August but they should be out within the month. Sneak-previews of both books are now online – see the Conducting & Coursing Order and Method 300 pages. Update: Sorry, I still don’t have the books but they are now complete and I’m in the process of placing that order with the printer, so I should have news soon. 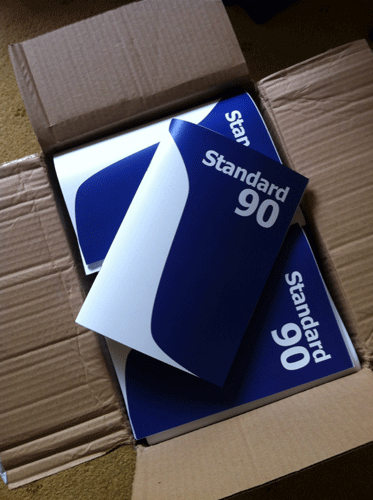 I now have 200 copies of the first edition of Standard 90! After a lot of hard work it’s so nice to see it finally here in reality. I’m selling them for £7.50 – I calculate it costs me £3.50 to produce and send, the rest will be going to Cancer Research UK in memory of Dad. If you would like to purchase a copy, please see the Standard 90 page. You can now also buy all the books online. Today is a momentous day! After 8 years of talking about it, I have finally reached the point of placing an order at the printers for “Standard 90”. Of all Dad’s books, Standard 70 has been the best selling of recent years but unfortunately it went out of print in 2009. I had initially planned to reprint it using the old film that we located in the loft. However it turned out to be not in a very good condition and so a reprint would require reproducing the book digitally.